3rd Place after second day. 9th Place Overall. 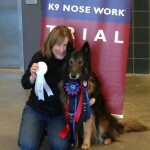 Six of Gail’s students competed in the NACSW Elite Division held at the Woodstock Fairgrounds, Woodstock, CT. They are Maria and K9 Kirby, Anne and K9 Rockit, Sandy and K9 Hope, Cheryn and K9 Crook, Natalie and K9 Thorfinn and Karen and K9 Taz. Each of these K9NW Teams earned points toward their Elite Division Title and Maria and K9 Kirby came in 3rd Place Overall and Anne and K9 Rockit came in 6th Place Overall! Congratulations to all!! !